Asking Your Lakeview Dentist: Why Mouth Guards Are Important This Summer! Summer is here and we’re SO excited to be able to get outside after this LONG winter here in Chicago. We’re able to pick up our outdoor sports, right where we left off last year. Maybe you are pumped to get back out on to the courts with your basketball league, or you’re ready to sprint down to the end zone with your flag football team. But remember when packing your sports bag, that you throw your mouthguard in there as well! Or maybe you, yourself, are not playing the game but your children are, so definitely make sure that is accessible!! Those little guys can protect your teeth while participating in sports in so many ways. Did you know that athletes are sixty times more likely to experience tooth damage when they don’t wear a mouth guard, with those involved in contact sports having a 10 percent chance of getting a tooth or jaw injury each season? That’s why Dr. Jessica Emery highly recommends if you play any contact sport, that you should be wearing some type of protection to your mouth. You see professional athletes on tv with them in ALL the time, you may just not know it! That is until they decide to stick them out of their mouths. (Kinda gross….but good for them to wear them!) A mouthguard is really a simple item that protects the teeth and jaw from damage related to impacts. And you may not think about a mouthguard right away, but remember if you’re buying a football helmet or hockey stick that can cost over $150, mouth guards can be one of the least expensive pieces of protective equipment there is! So PLEASE make it a piece of the collection when picking out your protective gear. They can also protect your soft tissue (like your gums and cheeks) from lacerations, reduces your chance of jaw fractures AND help limit the risk of tooth damage related to impact. And even better, they can possibly help reduce a concussion from certain impacts. We do recommend a custom fitted nightguard for best results, as an over the counter one may not fit properly in your mouth. A “boil and bite” may be a great temporary fix while it can still be molded to fit your mouth, but a custom-fitted mouthguard will be more secure and will provide you with more protection. The American Dental Association urges athletes, parents/caregivers and coaches to be proactive as they head out this summer and stay safe on the field. 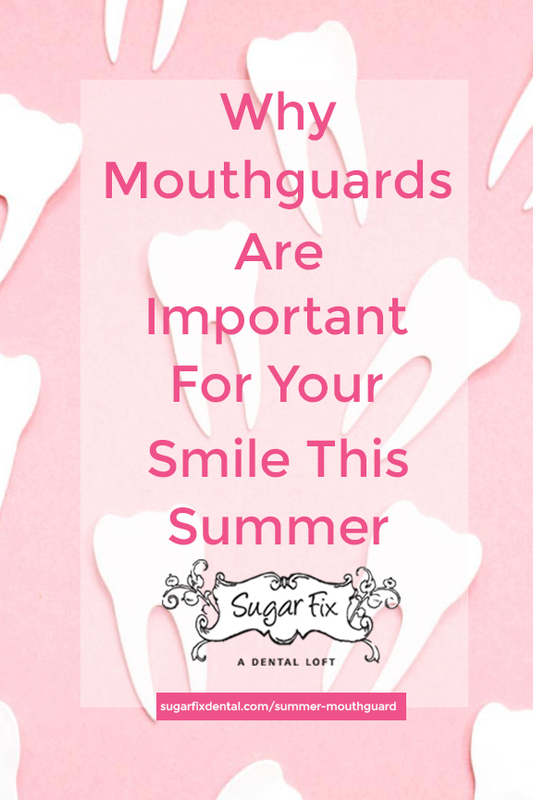 Here at Sugar Fix Dental Loft, we can answer any questions you may have about the different types of guards and which one may be best for you. You can schedule below to set up a consultation or feel free to give us a call at 773-883-1818 to speak with our clinical coordinator.